Sometimes I read some crafty blogs and feel wholly inadequate – half because they seem to have it all wired tight and half because they also seem to have the dishes done. I always tell myself that I’m not seeing what is just to the left of the camera lens, AND, I may also appear to be that wired tight crafty mom and I know my real life. Just in case someone was giving me a superwoman title I have to admit that my crafts are often at the expense of some other house keeping thing BUT as I’ve been home for a few months now things are actually getting better overall in the tidy department. When I was working and going to school I still wanted to do crafty things but with the 2.5 children I just managed to do a craft here and there and at the expense of laundry usually and I could not even give a thought to really organizing the xyz closet etc. Now I organize and craft with the kids and do the careful things when they are napping and my creative side is so much more happy. I have been collecting fabric to do seasonal curtain panels for years and I finally got them done for both Halloween and thanksgiving/fall and I have Christmas/winter ones ready to go. Organizing with them takes 10x as long as it would without them but it isn’t impossible and I think I actually have a playroom that is worthy of writing about sometime soon. The pillow set is another inspiration from Pinterest (my muse, my meth, my motivator . The one I pinned was one long rectangular pillow but I like the two separate toss pillows better, plus, I can sub in other words. I got the pillow forms from Ikea for 1.50 each, I got plain white pillow cases from walmart for $6 for the pair and I googled ‘free type fonts’ for a cool font to print onto iron on paper, this particular font is called ‘FoglihtenNo04’. I did not cut down the pillow case since it was so thin you could see right through it, I just folded it up such that there is 4 layers of fabric around the pillow and I hand sewed it shut. I ironed after I had placed the pillow because there was zero chance of getting it centered otherwise so I put a cutting board with a dish towel around it into the opening to iron onto and it worked ok. The curtains are JoAnn’s fabric on Ikea hardware. The hardware is $5 a panel and incredibly easy to use once you have the rail set up. It is just a top and bottom bar on a straight piece of fabric that you slide onto the rail. I originally thought that I would just have one pair per season but I am thinking now it might be worth making the reversible and making Halloween and thanksgiving share so all I have to do is flip it around – save me a few $$$ and time and storage space. I like little decorator touches like this that can be part of our lives not ‘do not touch’ items. Who knows, maybe in like 10 years I’ll have organized everything to the point that it just stays tidy… I’m not taking bets on that however…. Don’t worry, I won’t be stopping, I just might not hit every Sunday. What does a Capt America Cake and Turkey cake pops have in common? This came about because we decided to celebrate my Lawful-Good* nephew (whose birthday was actually the 28th) birthday when we were all together over last week. My girls are OBSESSED with youtube cake making videos and we knew TJ would adore the capt America cake as seen in this video Part of the coolness of this cake is that there is an American flag on the inside, but, (spoiler alert) that is created by combining two cakes into one layer thus ‘wasting’ an entire layer of cake (half a box!). I thought for some time about what to do with the extra cake and then it came to me – Cake Pop! A cake pop (or cake ball, popper etc) is a baked cake smooshed up with a can of frosting and covered in chocolate, why not use my extra cake and some frosting to make good (and festive) use of the extra. 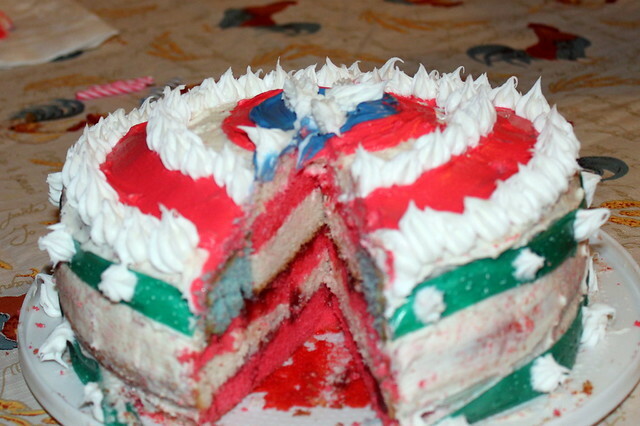 For the record my ‘leftover’ layer of cake (a ring of red/white and a circle of blue) made about 18 large pops. Thanks Bakeerella for the picture and the inspiration.
. 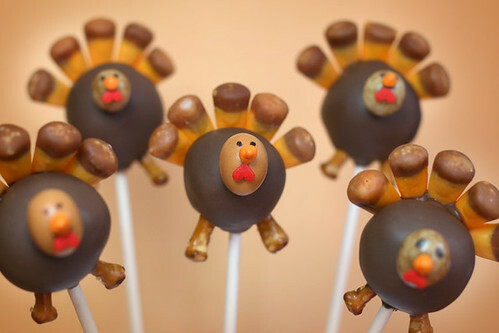 The most fun part about cake pops is finding ‘things’ to use in the candy aisle. The hardest part is then defending that candy from everyone – I suggest hiding it, or, deciding what their cut will be. The pictures all have the tail feathers made of candy corn but I don’t know if the Midwest hates them or loves them because I can never find them in the stores so I had to get creative. I went with Swedish fish for feathers because of their size and colors but they actually tasted good with the chocolate I used a peanut butter m&m for the head and that tasted very good with the cake and chocolate. I used some broken pretzels for the legs and you can’t beat chocolate and pretzel. Finally I used good n plenty for the waddle and I think I should have used something different since it didn’t look great but it did match the flavor profile. Lots of times I see gorgeous pops or other candy creations and I can’t imagine eating it because of the inharmonious flavors they have together because they look good. I’m more for a tasty bite and will sacrifice a little on the looks. If you are wondering about how to make the capt america cake the youtube video is right-on for how to make the cake part. I don’t know if this suggestion is in the comments but used two boxes of cake to make 3 large 9in rounds. I had some trouble spreading frosting between the cut layers due to excessive crumbs so I used whipped cream on the white layer and strawberry jam on the red layers. I am also not into how fondant tastes so I just frosted the cake with a thin layer of white then I piped the rings of red then the blue center and smoothed them out and after that I piped white for the white rings and it nicely covered any waves from the colors and finally a star in the center. It is not as pretty but it was very tasty. My family ate it up no problems. The cake pops were made fairly late at night after a glass of wine but I do think my cake to icing ratio was off so the pops were on the soft side so I had to dip quick so the chocolate was on the lumpy side. The Swedish fish were great because I laid them out in a fan and just set the pop onto them. It was so simple to have them solidify on their back and since they were ‘face’ up I could quick add the head etc. They turned out yummy but maybe not so pretty but you know, turkeys are not pretty…. This was my first cake pop decorating and only my third ‘fancy’ cake (#1 was the owl #2 the rainbow) and they are far easier they you think especially when you don’t insist on perfection because they are going to be eaten about 10 seconds after it is served. Since she has no teeth it was easy for Fiona. I on the other hand have two shiny new fillings! I have to say, bringing a baby to the dentist was a gamble but she did really well. She can’t quite sit up yet but pretty soon I’m sure. How to later but for now a picture (that does not do it justice). The hardest part was defending the candy from a table of tipsy relatives.